Hi Everyone! First off, THANK YOU! You know how obsessed I am with my dog, Maddox, and how much my heart breaks when anything happens to an animal, so I decided to take action and raise money for the ASPCA! Maddox and I will be doing a 5K between June 10-30th, I don't have a definite date yet, but I will post pics of our accomplishment on this page and on social media! Help me to end pet homelessness and give abused animals another chance! I am excited to be participating and honored to be raising the awareness and the much needed funding to support the ASPCA's programs. 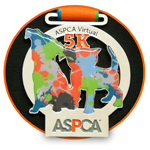 Your donation will help the ASPCA provide life-saving programs and services to millions of animals nationwide. The ASPCA is very important to me and I appreciate your help.